Congratulations also to our other national age group winners, Years 1-3 Billy Mahaffy, Scotch College Junior School, WA; Years 4-6 Samuel Nelson, St Joseph's Catholic Primary School, QLD; and Years 7-8: Shalayne Smith, Marymount College, QLD. The National Age Group Winners spent yesterday at the Art Gallery of NSW in Sydney for the unveiling of the National Winner. The young doodlers also saw their work in a special display at the gallery. Special thanks to Leanne Carr from the Art Gallery of NSW for her generous support of the competition and for an unforgettable day at the Gallery. Thank you to all our thousands of doodlers from across Australia, and look out for Ineka’s doodle on our homepage. Earlier this year we announced our latest Doodle 4 Google competition, in which we asked school students across Australia to draw their own version of the Google logo, inspired by the theme “If I could go back in time I would...” Now, more than 26,000 doodles later, we can announce the winning entry. Congratulations to Ineka Voigt of Canberra High School in ACT who has just been named the overall national winner for this year’s Doodle 4 Google competition. Ineka has won a Chromebook laptop and Nexus tablet for herself and $10,000 worth of technology for her school. Her doodle will be featured on the google.com.au homepage next year. Last year we helped to publish the Careers with Code guide, which showed the wide variety of careers that computer science can lead to - everything from art and music to medicine and agriculture. In Australia alone, demand for skilled computer scientists is growing rapidly. In this year’s guide we’ve showcased more amazing and diverse Computer Science careers in fields such as sport, gaming, health, sustainability, and more. Australia needs technically-capable grads with a passion to solve the really tough challenges facing the world. We hope this guide will inspire your students to take up the challenge and become the change makers, innovators, and creators of the future. 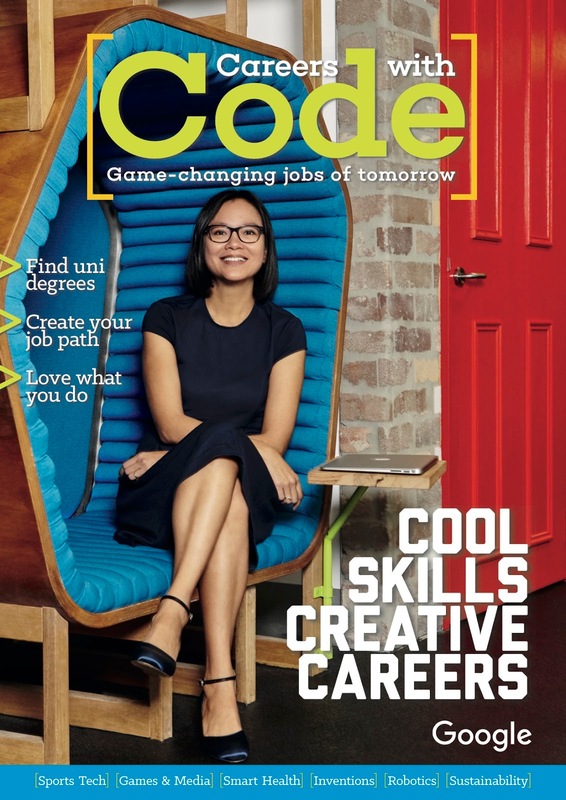 Today, with Refraction Media and we're launching the 2015 edition of Careers with Code, with an unprecedented distribution of 175,000 magazines – 50 copies for every Australian high school, university careers centres and science outreach programs - being distributed across the country. 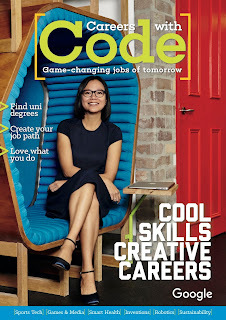 Careers with Code, a magazine, digital e-zine and website, shows high school students the wide variety of careers that computer science can lead to – everything from art and music to business, sports, health and conservation. We encourage you to share this resource with the widest possible audience of students, teachers and parents - it’s not just for the tech, science or maths classes! Technology doesn’t stand still. Neither do careers, or the skills that we need for the jobs of the future. Just as careers like ‘knocker uppers’ (yep it was a real job) were replaced by alarm clocks, ice cutters by refrigeration, and lamp lighters by electricity, so too are we seeing a transformation in the types of jobs we’ll need and want as a future society. As few as eight years ago there were no Android or iOS developers - because there were no smartphones! Self-driving cars were just a dream. And 3-D printing of prosthetics wasn’t even imaginable. Yet today, all those these sectors are thriving and likely to supply many of tomorrow’s jobs.